When I wander about with my camera looking for bugs I generally look down towards the path-side shrubs or I look at the tree trunks for camouflaged moths / spiders. Yesterday I realised that I rarely looked at anything above eye-level. On my way back down the hill I changed approach and looked at eye-level and above. I was rewarded with a few finds that I would otherwise have missed. 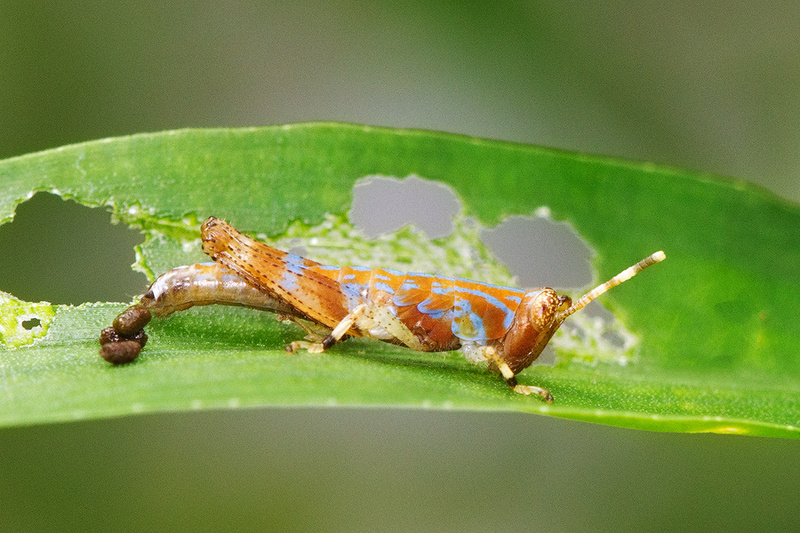 First up is this very attractive little grasshopper nymph. 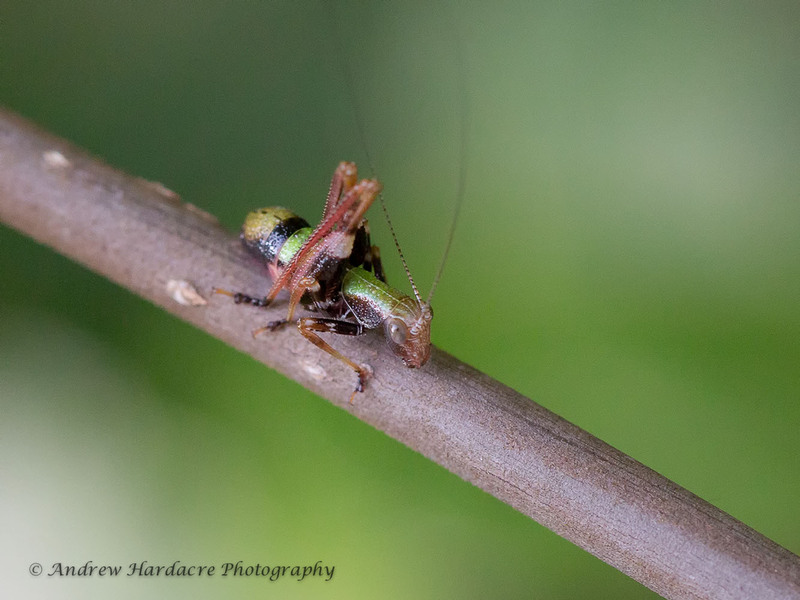 You know its a nymph because it is still wingless. It was all on its own. I searched high and low but failed to find any kith or kin. The trouble with nymphs is that they can bare startlingly little resemblance to the imago (adult) gropper. Who remembers this from way back when? Who would have thought that the top one was once just like its pooping younger version. This ID mystery took some solving. I spent several hours trying to identify the pooper. 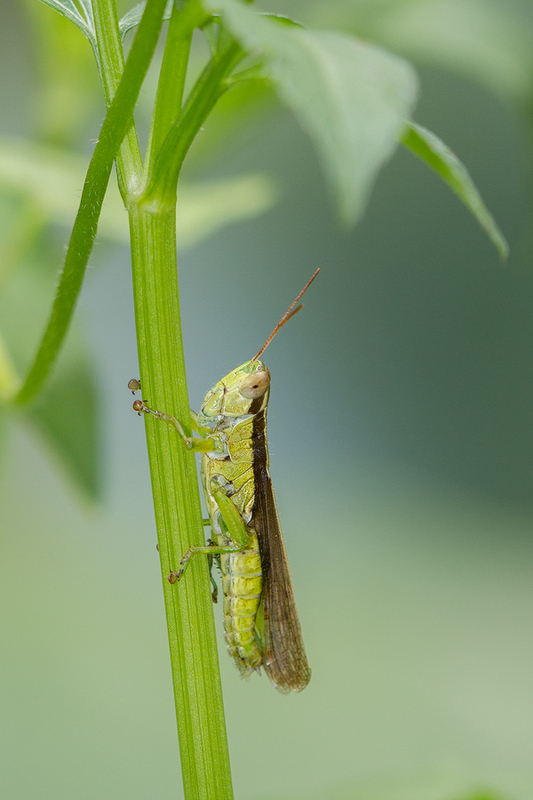 Grasshopper poop is called frass, I believe, if you are of a technical bent. Oh and it is Oxya chinensis in case you wondered. Here’s another one. Or two to be precise. Making more gropper nymphs. 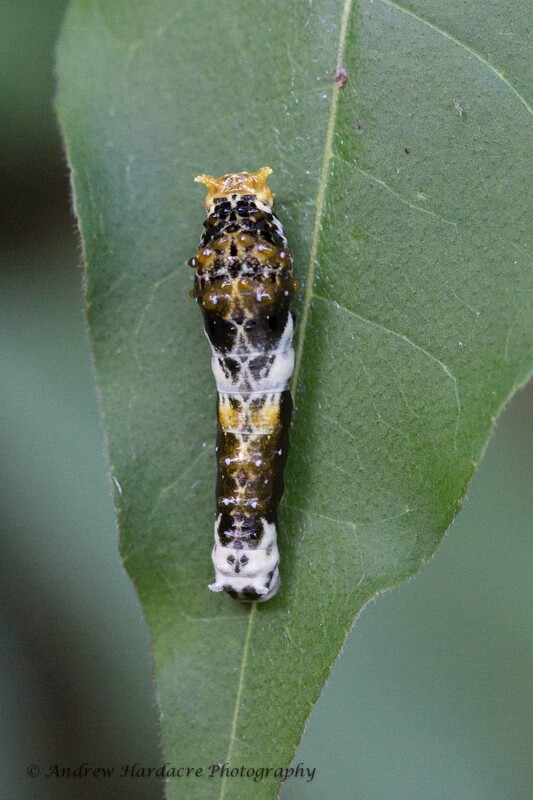 This is probably a 3rd or 4th instar Papilio helenus helenus. Its very similar to another species so I am not 100% sure. Do you see the cat face? Of course if you only look up then you miss things as well. I found this on the way up. It did not want to hang around so I only had half a dozen handheld shots before it scuttled off. 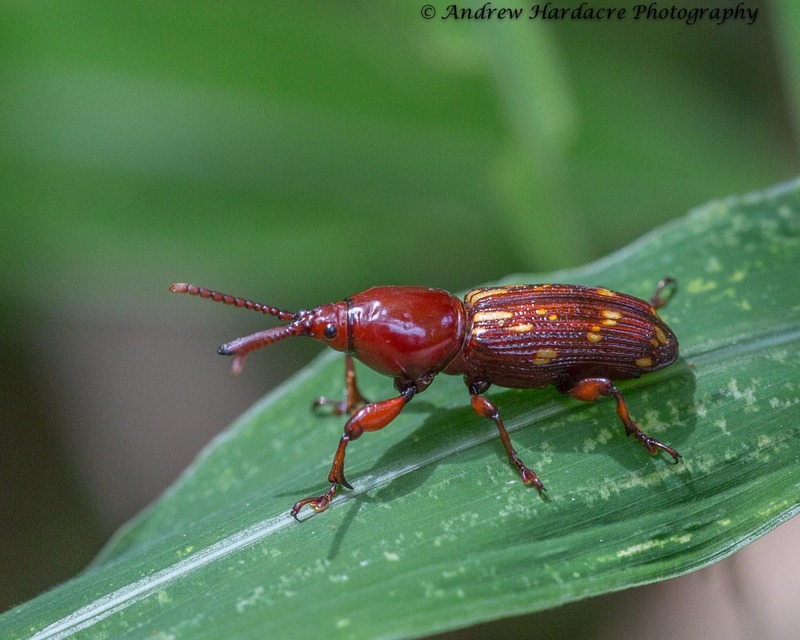 It is a weevil. The power of Facebook tells me it is Baryrhynchus poweri. 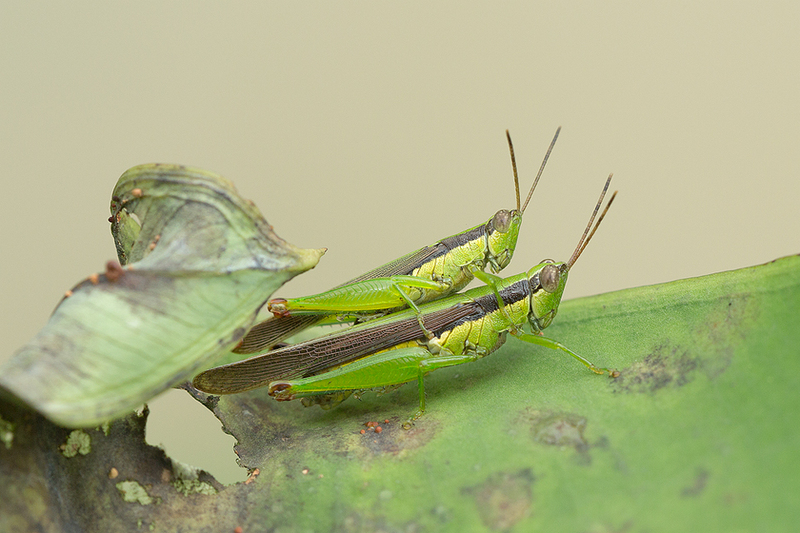 There are some very knowledgeable people on FB if you know where to find them (clue: check the entomology page). And that is it for today. Work tomorrow – another unwelcome interruption to my attempt at retirement. But if you have a photography habit you have to fund it. And Mrs. Ha desperately needs (not) another pair of shoes. I assuage my lens-complex guilt by signing off a chitty for another trip to the shoe emporium. Such are the compromises of a happy marriage. So I am told. I walked up the hill behind the house today. Rather less strenuous than yesterday but good for the waistline. 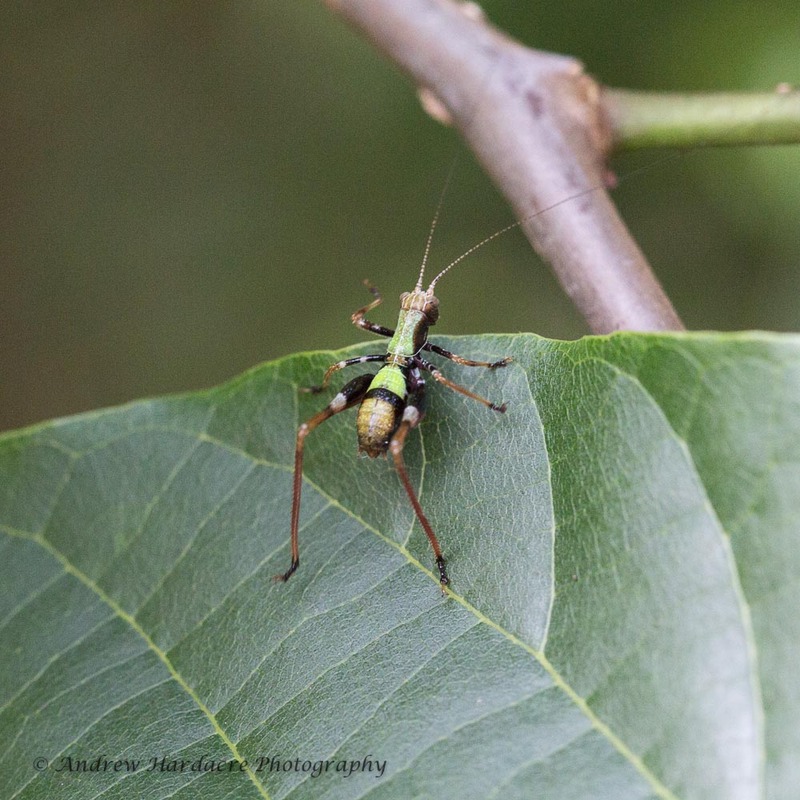 I have a few nice bug shots but I am trying to ID them before I launch them on the blog. 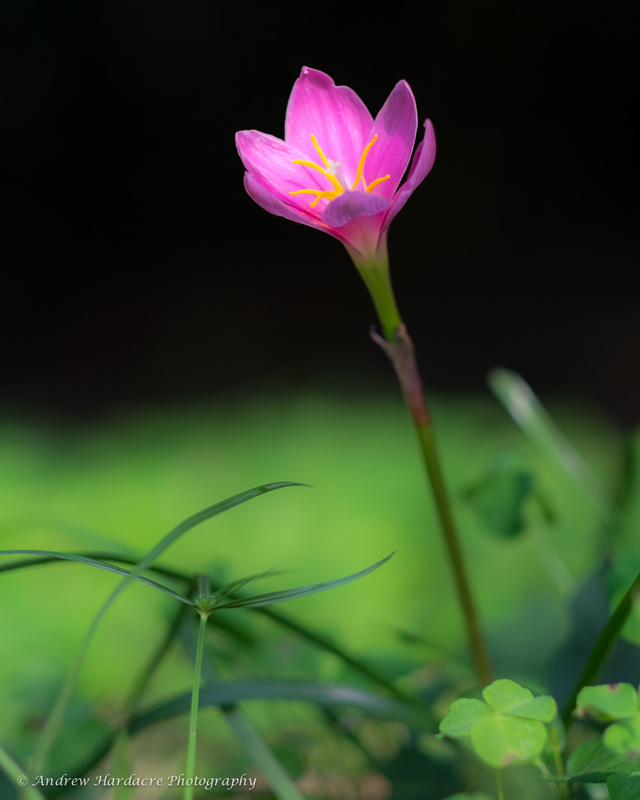 Instead here is a consoling flower. This was taken with the 56mm F1.2 portrait lens on my new Fuji X-T1. Why consoling? Well whilst I was out my phone beeped at me and Pavlov’s reaction kicked in and I checked to see what it was. An old friend and colleague was letting us all know that his cancer treatment has run its course and he has no more options. His horizon is 3-6 months. He seemed to be doing so well and then this. At times like this I need nature to reaffirm my faith in the world. I’m not one for love stories. I don’t do book reviews. So how did I come to read (and write about) And then like my dreams? Well quite simply I enjoyed Margaret Rose Stringer’s blog and thought I would like to read her memoir. I tried to buy a Kindle version but it seems rights are sometimes wrong and I was not allowed to buy a copy. I don’t pretend to understand why I can buy e-books from Amazon USA but not UK or Australia. There must be a reason. I decided it was rights. I mentioned that in passing and M.R. immediately offered to send me a copy. And she did. If I had to pick a word to describe the memoir I would choose bittersweet. M.R. is sometimes searingly frank (self-critical) about herself and invariably devotional in writing about her late husband, Chic Stringer. He was indeed a man of many talents. He was an accomplished photographer, a wonderful and seemingly unflappable chef, a craftsman and handyman able to build a house (my limit is wiring a plug), a renaissance man in his learning, which he seems never to have flaunted and of course he coped with Margaret Rose through 31 years of mutual adoration. A symbiotic relationship in which she needs to be loved and he offers unconditional love. And a cornucopia of knowledge. The story of how they discovered a shared love of Placido Domingo is enchanting. They stopped not at buying his CDs and travelling to see him perform. Oh no. Chic and M.R. had dinner with him. Dining with our heroes is difficult. Sporting heroes can be bought at ‘events’ and indeed I shared a dinner table with the great Phil Bennett once. There were several hundred people in the hall but I sat just a few feet away from him. The only let down was that he wore a brown suit. There we all were in DJs and Phil wore a brown lounge suit. Nobody told him, he claimed. Duw its hard. But as I eventually get back to the point, I must stress that Chic and M.R. simply enjoyed a small, intimate dinner with Placido. There is no triumphalism but a sense of euphoric disbelief that they could do so. And my heart swelled with pride and joy for them. The book is written in short chapters with scene settings incorporated as befits a story set against the backdrop of the film industry. There are some black and white photos and some glorious colour ones. The book is very well produced. It is evident that M.R. is a much more talented lady than she admits and her ability to pick up new skills and try new challenges is admirable. I suspect she is far more computer literate than I. The last part of the book is about Chic’s battle with cancer. He bears this with great dignity. We often say that don’t we. The obits say “after a long illness bravely borne”. Well Chic’s approach seemed to be to spare Margaret Rose as much as possible and to maximize the time they had ahead of them. As the end draws near you can feel the frustration and anger with the health system that shows little sense of care. And finally Chic just wants to come home to Margaret Rose. It is almost impossible not to well up when their 31 year journey together ends. Since then M.R. has made sure Chic Stringer has a place in the National Film and Sound Archive so we can look him up online. She has written this book and it is clear that he continues to be a dominant part of her life. A lot of memoirs feel ghost-written. This is too raw and too honest to be anything but written from the heart. I have hardly done it justice. I have not touched on family and friends, childhoods, the pre-Chic & M.R. era and I leave you to discover more. It probably won’t find its way to the top of the best seller list but it is a book I am happy to have read. It reminded me that some of life’s greatest pleasures are more or less free: love, food, music, peace of mind and the ability to write. Wouldn’t it be a pleasant irony if someone picked up the film rights? To paraphrase the infamous review: me Leica.